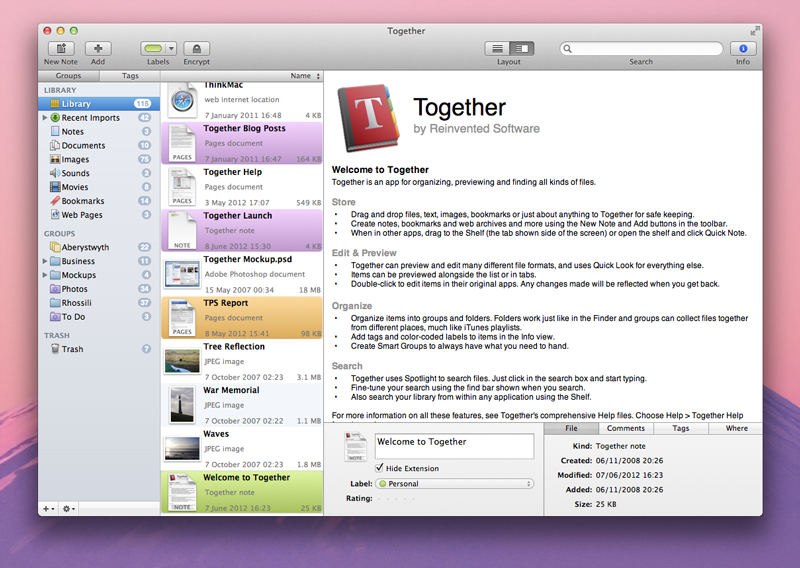 [prMac.com] Swansea, UK - Reinvented Software announced the release of Together 2.2 for Mac OS X today. Together is an application for storing, previewing, editing and searching all kinds of files. Version 2.2 introduces many new features such as intelligent auto-tagging, tag bundles, nested groups, rearrangeable tabs and numerous improvements to previews, the classification of web pages and the systemwide Shelf. Together 2.2 brings innovations to tagging, including intelligent automatic tagging, which works by matching the content of items in Together against previously tagged items with similar content. Tags can now be organized into tag bundles, and Together's unique system tags, which shows things such as labels, folders and ratings as tags, are now grouped together in their own bundles. Organizing items in Together 2.2 is more powerful now that groups and smart groups can be nested in folders. Together also has a new dedicated group for web pages, to collect web archives, web PDFs, printed web pages and more into one place. Together's previews have been enhanced with rearrangable tabs and the ability to zoom note and text document previews. Together's systemwide shelf has been enhanced so that items can be renamed before importing, the new dedicated Find in Shelf global hot key provides instant access for searching the current Together library and Together now returns to the previously used application after tagging imports or saving a quick note. This is a free upgrade for all registered Together 2.x users. A full license costs $39 (USD) and upgrades from KIT 1.x are $14.95. Education and bulk discounts are also available. Reinvented Software was founded in August 2004 by long-time Mac developer Steve Harris who, having wasted 10 years working for other people, decided to dedicate his life to making the best software in the world - software for the Mac. Reinvented Software currently publishes two applications: Together, a revolutionary file organizer and Feeder, the premier RSS and podcast publishing application, both exclusively for Mac OS X. Copyright 2004-2008 Reinvented Software. All Rights Reserved. Apple, the Apple logo, are registered trademarks of Apple Computer in the U.S. and/or other countries.